So T-Paw ran for the big prize in 2012, and despite almost ideal positioning as a credentialed non-Romney who was acceptable to movement conservatives, he was the first significant candidate to drop out because he couldn’t convince a few thousand people to take a free bus ride and eat a free lunch on his ticket in Ames, Iowa, right next door to his own state. The early demise of his candidacy, however, meant that he had scant opportunity to offend Mitt Romney (or anyone else in the GOP)—and he blew his one effort to do so by so timorously mentioning “ObamneyCare” just once in a candidate debate. Now he is, if you believe the pundits, the frontrunner for the Veep position on a ticket with far better prospects than McCain-Palin had in 2008, and his very shortcomings appear to be real assets to Team Mitt. They don’t want “excitement” on the ticket to distract attention from the Big Guy or from his campaign’s efforts to hypnotize swing voters into thinking about nothing but macroeconomic indicators when they enter the voting booth. And even what must have seemed the low-point of Pawlenty’s career, his rejection by McCain in favor of a little-known first-term governor from Alaska, is a selling point now, because Romney wants to let everyone know he’s not a “gambler” like the guy who never even considered him as a running-mate in 2008. 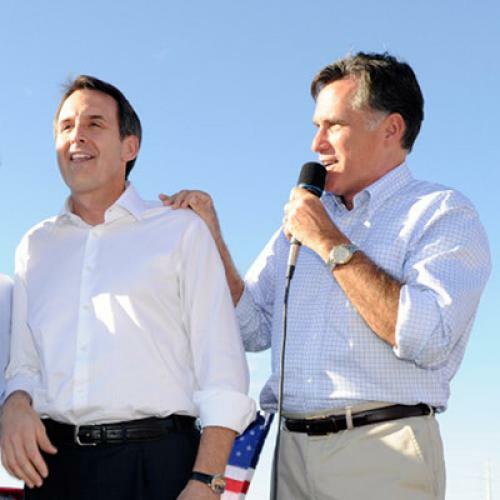 So Pawlenty is falling upwards at a steady pace. And who knows: If Romney loses and the very unlucky Barack Obama gets to deal with the second global economic meltdown of his presidency, what better, safer candidate to pick up the pieces in 2016 could Republicans possibly find? If only they could just stop yawning!